20 Years After (2008) - Sci-fi-central.com.  USA  2008  95m   Directed by: Jim Torres.  Starring: Joshua Leonard, Azura Skye, Diane Salinger, Aaron Hendry, Nathan Baesel, Reg E. Cathey, Charlie Talbert, Malika, Khadijah, Shannon Eubanks, Dan Beene, Deborah Duke, Philip Neil Parker.  Music by: John Heitzenrater, Chris Johnson. I don't care about budgets and such, so the fact that the cinematography had a kind of unfinished feel to it didn't bother me, however I know it bothers some. Next, and most detrimentally, there is very little forward movement. The plot is severely lacking, in the special features they mention that this was a stage performance before a film and I think the cutting floor scooped up a lot of explanations that could have really helped the audience to understand. Now that being said this movie had some things that even most blockbuster films don't. One: SOME REALLY GOOD ACTORS. The actors are not wooden and don't pander to the camera (at least not most of them). The character Sara is specifically very convincing and easy to empathize with. Two: ORIGINALITY. 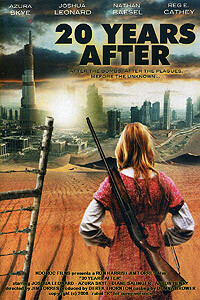 This movie was not a typically post-apocalyptic mess. No radiation freaks, no scantily clad bikini babes, no dune-buggy rally... Finally: many of the visuals were stunning. (I'm thinking specifically about the blue bottle tree). Review by Michael-d-duncan from the Internet Movie Database.